On March 18th this year, the University of California at Berkeley became the first major University in the USA to pass a bill that requires the divestment of university funds from companies that “materially support or profit from Israel’s occupation” of the Palestinian territories. The historic bill came after a long campaign by students to have the university sign up to the Boycott, Divestments and Sanctions (BDS) movement, which was a call on behalf of 171 Palestinian civil society organisations calling on people of conscience all over the world to impose broad boycotts and implement divestment initiatives against Israel “until it fully complies with the precepts of international law”. While similar bills have been passed at universities around the world, including, in the UK, the University of Manchester and the London School of Economics, the current bill was undoubtedly the largest success of the campaign so far in the US. The senate meeting to discuss the bill attracted unprecedented levels of interest, with the meeting having to be moved to a larger venue to accommodate people. The meeting, which began at 9pm on Wednesday the 17th of March, also went past the usual cut-off time of 1.30am and finally ended at 4am early on Thursday morning. The meeting had to be extended to accommodate the 76 speakers who argued both for and against the bill and also for the senators to discuss proposed amendments to the original bill. The speakers ranged from undergraduate students to Vietnam War veterans, rabbis and church ministers. Israeli and Palestinian nationals also took part. The bill garnered support from Israeli and Jewish voices, not least from one of the bill’s co-authors, Tom Pessah, a Jewish citizen of Israel. After some amendments, the bill was passed on a 16-4 vote. 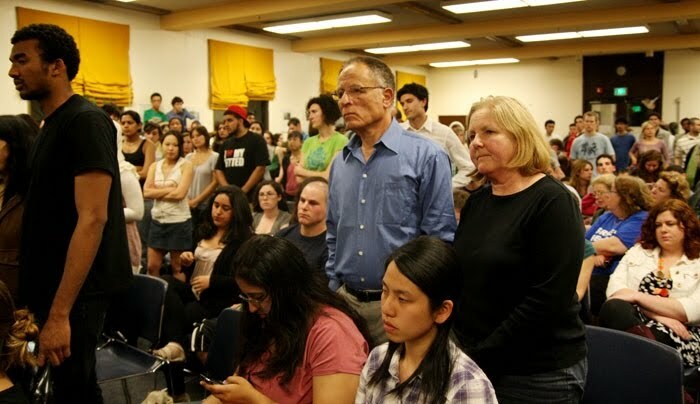 The bill’s authors were both members of the UC Berkeley Students for Justice in Palestine (SJP), which had been working on a divestment campaign from companies that profit from the occupation of Palestine since 2000. UC Berkeley Law Students for Justice in Palestine played a central role in researching the legal issues and the international laws pertaining to Israeli human rights violations. The bill provided references from reputable international sources such as Amnesty International and the United Nations to construct its compelling case of persistent and deliberate human rights violations by Israel against both the Palestinians in Gaza and the West bank and Lebanon. One of the main charges against the bill was that it unfairly singled-out Israel but ignores other countries that also commit war crimes and human rights abuses. However, as pointed out by the bill’s authors and many of the supporters who spoke at the meeting, both South Africa and the Sudan have had similar bills passed against them in the past. The concern was also specifically addressed in amendments made to the bill before it was passed so that it included the call for future action against all companies that aid human rights abuses the world over. The bill specifically named and targeted two companies, General Electric and United Technologies for providing military technology used against Palestinian and Lebanese civilians during recent military campaigns. General Electric manufactures Apache helicopter engines; United Technologies manufactures Sikorsky helicopters and F-16 aircraft engines. The bill also made the provision for future divestments from other companies that are shown to have participated in human rights abuses anywhere in the world. In this respect Morocco and Congo were two other countries named in the bill as committing war crimes and benefiting from UC investments and a committee was to be set up to monitor and promote university progress in divesting from companies that take part in these countries’ abuses. While Hampshire College in Amherst, MA became the first US educational institution to divest from companies directly involved in the Israeli occupation of Palestine in 2009, an action also advocated by the SJP; the reputation and standing of Berkeley is such that this bill garnered much more national and international coverage, and so was a hugely important step for the BDS campaign. And yet, a week after the vote, and after a sustained period of lobbying from both sides, the student body president, Will Smelko, vetoed the bill on the basis that “It is the role of the ASUC to balance all voices, perspectives, and views in the most fair, honest, ethical, and comprehensive way possible.” This definition of “fair” and “ethical” disregarded previous precedents of divestment against South Africa and Sudan, not to mention the fact that the bill targeted US weapons companies. Ultimately, in the name of “fairness”, the democratic will of the majority was ignored. Proponents of the bill attempted to get the veto overturned in two further senate meetings that both went on the entire night. Attended by over 300 people on each occasion, both sides brought in high profile speakers to articulate their case. The American Israel Public Affairs Committee (AIPAC) were present in force and the Israeli Consul General also attended and spoke in defence of his country, and declared the bill to be against a peaceful resolution of the occupation; significantly, using the word “occupation” in relation to Israel’s military presence in the West Bank. The pro divestment campaign called upon statements from international figures such as the Archbishop Desmond Tutu, Professor Noam Chomsky, the writer and activist Noami Klein and four former Nobel Peace prize laureates. There was also moving testimony from Hedy Epstein, an 85-year-old holocaust survivor who pleaded with the senate to back divestment to help prevent the human rights crimes committed by the state of Israel. Testimony was also provided by a phone link with Richard Falk, United Nations Special Rapporteur on Palestinian human rights, who spoke about the experiences he had witnessed of human rights abuses committed by Israel in the occupied territories and Lebanon. Campus support included a diverse grouping of over 40 student organisations including, amongst others, the Muslim, Sikh, Philipino, Arab, Iranian and Afghan Student Associations, the Queer Alliance and Resource Centre, Berkeley Stop the War Coalition and the Hispanic Engineers and Scientists. The bill also had the support of 114 University of California faculty members and also over 40 off-campus support organisations including Jewish Voices for Peace and Gush Shalom. In the month that passed between the first meeting and the second the senators who voted for the bill were subjected to intense lobbying from the anti-divestment pro Zionist lobby. This lead to two senators who had previously voted for divestment to change their vote and, crucially, one senator changed her vote to abstain, citing a threat to campus harmony and inadequate knowledge of the situation to make a decision. The bill thus failed to garner the required 14 votes in the senate, falling just one short, a feat only achieved through the anti-majoritarian veto by the student body president and a well financed lobbying campaign putting pressure on three senators whose votes proved decisive. At the end of the third and final meeting where the veto was upheld, hundreds of students walked out of the meeting with tape over their mouths and their left fist raised in the air. The tape represented the silencing of their views and, as put by Senator Rahul Patel, their raised fists symbolised “The seeds of truth and freedom that we have sowed tonight.” The students reconvened outside to share their feelings about the vote and pledge to keep working towards divestment. While the bill was ultimately vetoed, the movement gained massive media coverage and sparked similar divestment campaigns across University of California campuses. The student association at UC San Diego is currently debating such a bill and more will follow. The current battle may have been lost but the Boycott and Divestment Strategy has gathered an immense amount of support and momentum and the prospect of divestment across University campuses throughout North America is now an achievable goal. As put by UC Berkeley and SJP alum Sophia Ritchie speaking after the veto: “Something has shifted — in the discourse, in the sheer numbers of people who are concerned, in the solidarity work and coalition building amongst a broad and truly diverse range of student and community groups, in the energy around Palestine — that cannot be ignored. In this way, we are winning.” Just as the movement against Apartheid South Africa took time but was ultimately successful, it is no longer a matter of if but when student groups and organisations will stand up for innocent Palestinian civilians against the serial human rights violations of the state of Israel. Humza Tahir is an academic and activist. He is a post-doctoral researcher at UC Berkeley and is involved in the University’s BDS campaign.